As the global leader in dye sublimation and digital printing solutions, Sawgrass is always innovating our inks to deliver the best, most accurate color possible. Part of this process is developing color management software and profiles specific to our ink sets, as well as the printers they work with and common substrates. The other part is formulating inks that achieve specific goals, such as delivering neutral blacks, enhanced skin tones, fine gradation, precise color matching and fluorescent colors and accents. Sublimation has always generated high-definition images with amazing color. When we introduced SubliJet-HD, a family of ink sets designed to work as part of the Virtuoso HD Product Decorating System, we focused on raising the standard for both color and definition. The first SubliJet-HD ink set, featuring traditional CMYK colors, significantly increased both when paired with the Virtuoso SG400 and 800 printers. This ink set contains a higher density of dyes and a much wider gamut, which, in turn, delivers deeper, richer and more vibrant color. Both Virtuoso SG400 and 800 printers use SubliJet-HD inks exclusively, and with these cartridges, increased maximum resolution from 600 x 600 dpi to 1200 x 1200 dpi. With the addition of the Virtuoso 25” 8-Color HD Product Decorating System featuring the VJ 628 printer, we began adding new formulations to the SubliJet-HD family to enable customers to choose the right ink set for their printing needs. The traditional eight-color Professional Photo configuration adds four more inks to CMYK: light cyan (Lc), light magenta (Lm), light black (Lk) and light, light black (Llk). The inclusion of these more nuanced colors makes the eight-color system more versatile for applications where color matching and definition are critical. The VJ 628 printer’s eight-color capabilities enabled us at Sawgrass to focus more on the color needs of our customers. We were able to create specialized formulas that would enable customers to use raster image processing (RIP) programs, such as Wasatch SoftRIP, to get even more color management ability for their investment. Here is a look at Sawgrass’ eight-color SubliJet-HD ink sets and how you can use them to get the colors you need. This new ink set builds upon the traditional eight-color configuration, but replaces the light blacks with orange and blue colors. Adding these two colors significantly increases the number of colors that can be created using sublimation technology (see the illustration ), as well as colors that are difficult to match with CMYK only, such as oranges, reds, blues, purples and Pantones. We have also replaced the traditional K ink with KXF (see below), so that prints with this set will have added longevity. This ink set was designed for product decorators who have color-critical applications, such as sports and corporate logos, school colors, flags and banners, signage, promotional products, uniforms and more. Print service providers, sign shops, service bureaus, promotional product vendors and sportswear/sports merchandise printers will find that this ink set is the ideal solution for their color-critical jobs. Achieving true fluorescent colors with CMYK or traditional eight-color configurations has been challenging in the past. The luminous properties associated with fluorescents call for specific colors that fall well outside the gamut achievable by these inks. Our new SubliJet-HD FL ink set replaces the two light black cartridges with fluorescent pink and yellow inks. This enables users to add a wide range of true fluorescent spot colors to images or produce completely fluorescent images for even greater special effects not possible with a CMYK-only solution. This ink set was developed for sublimation decorators who wish to add the excitement and visibility of fluorescent colors to their capabilities, and for a variety of applications, including: college and professional sports products, corporate logos, promotional and safety products, high-visibility signage and other products. 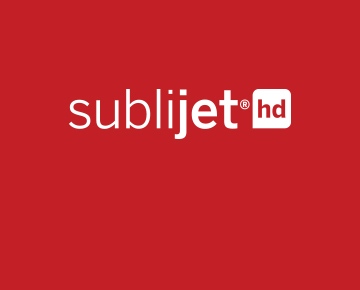 Like the SubliJet-HD XG ink set, SubliJet-HD FL uses a KXF cartridge for added image longevity. These two ink sets have been developed for professional photography and fine art reproduction. Both offer fine gradients and detail, enhanced skin tones, up to 1440 x 1440 dpi resolution and a much broader gamut of colors than CMYK. The main distinction between the two is in the black inks. SubliJet-HD Pro Photo has the three black inks in a traditional eight-color set: K, Lk and Llk. These are fantastic for deep, rich blacks. SubliJet-HD XF has enhanced black inks - KXF, LkXF and LlkXF. These deliver more neutral blacks than ever and ensure that prints on ChromaLuxe 2016 panels last three times longer than archival photo paper prints. Photo labs, professional photographers and producers of fine art prints will find using this ink gets them the depth of color, detail and nuance they are looking for. As you can see, when it comes to color management, it’s not just about the software you use. Choosing the right ink for your application is also a critical factor. We recommend researching the different types of inks available for your sublimation system and speaking with your preferred reseller about the advantages of each. Then, you can make an informed decision about which are right for you, and your prints will be more beautiful than ever.